Domino’s Pizza, the recognized world leader in pizza delivery and digital ordering technology, is giving customers yet another way to track their order from anywhere, at any time. Domino’s is launching its new app for Apple Watch, which includes the fan-favorite Domino’s Tracker®, beginning today. Customers can now track their order from the time it is taken, to when it is placed in the oven and ready for carryout or delivery, all from the ease of their Apple Watch. 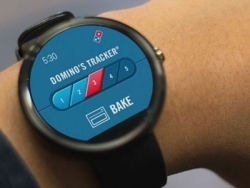 Domino’s is one of the first in the U.S. pizza industry to bring this tracking capability to Apple Watch. To download Domino’s app, visit the App Store for Apple Watch.